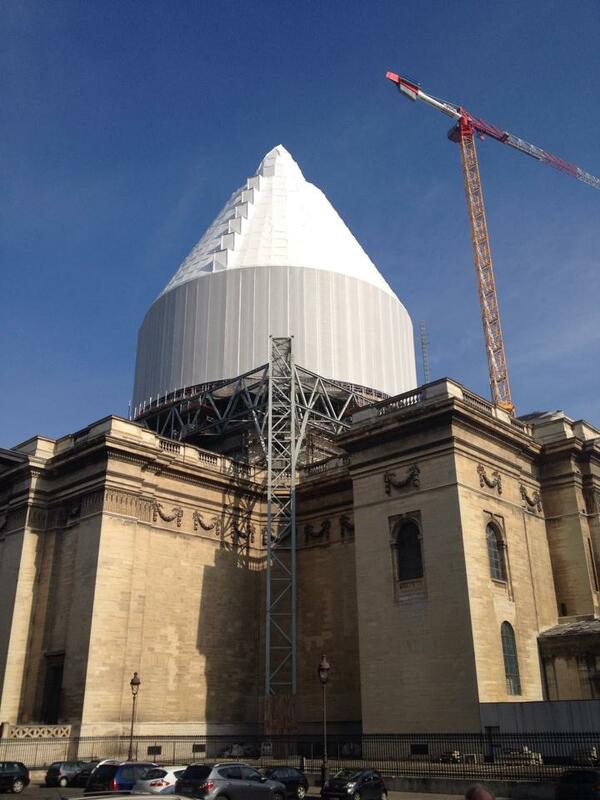 I just returned from this year’s Computer Applications and Quantitative Methods (CAA) conference, which was held in Paris last week. Overall, the conference was a great success, despite a number of teething troubles (particularly with IT support [ironically?]). I spoke on the Friday morning about using Heisenberg’s Uncertainty Principle as a metaphor for good cartographic practice. I’ll try to write more about that at a later time. One particularly impressive visualization of data that I saw was Lost Change, which maps PAS coins and their mint locations. Another very interesting paper I heard was about MicroPasts (another British Museum backed venture), which is designed to allow archaeologists to access crowdsourced labour and crowdfunded funding. I also enjoyed Philip Verhagen’s paper, as his project is encountering many of the same data rationalization issues as our own (and he only has to work with a single source database, rather than the 70+ that we are trying to combine). Next year’s CAA will be in Siena, Italy. They know how to pick places with good food and good cheer! This is yet another short post about trend surfaces, following on from previous (I)(II)(III)(IV)(V)(VI)(VII), but with a new dataset. After this, I think I have probably exhausted the possibilities for getting information out of our data using trend surface modelling, which is best thought of as an initial exploratory technique in any event. 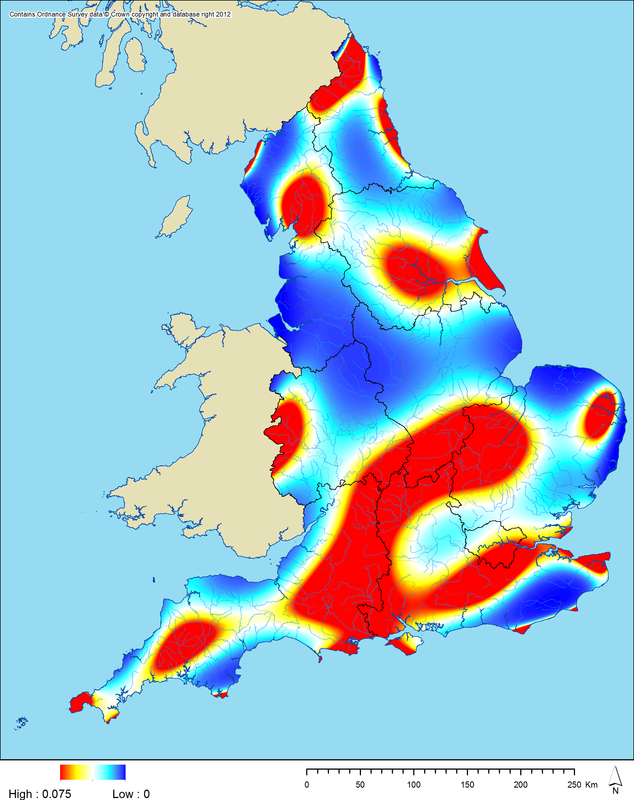 This time, I have been looking at spatial trends present in English Heritage’s Excavation Index, which has been kindly supplied to us by Tim Evans at the ADS, who recently wrote an excellent journal article on the potential of the Index as a research tool. This is a record of excavations and investigations that have taken place in England since around the mid nineteenth century. I do not think that it pretends in any way to be comprehensive, but it is another way of filling in gaps in our data, especially for archaeological work that took place before 1990. 12th power linear trend surface for all data in the Excavation Index. 12th power linear trend surface for EngLaID period data in the Excavation Index. 12th power linear trend surface for unspecified prehistoric data in the Excavation Index. 12th power linear trend surface for Bronze Age data in the Excavation Index. 12th power linear trend surface for Iron Age data in the Excavation Index. 12th power linear trend surface for Roman data in the Excavation Index. 12th power linear trend surface for early medieval data in the Excavation Index. So, what can we see from looking at these maps? 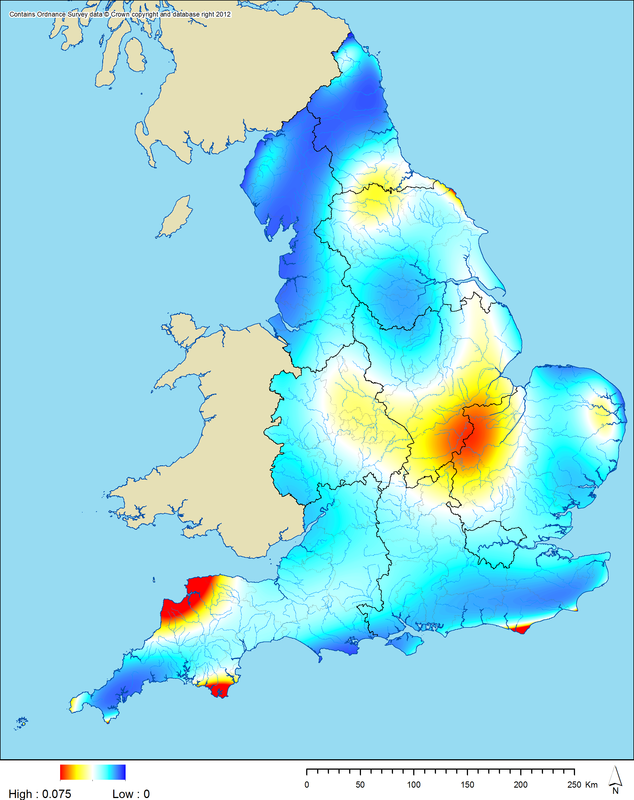 Overall, the Index shows greatest density of work in the south, particularly around Bristol, London and Kent. 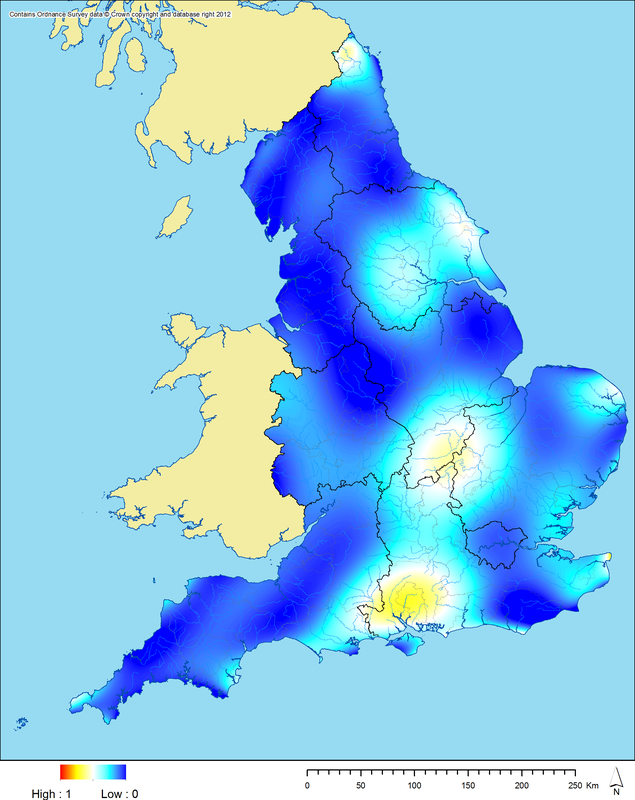 For the EngLaID period as a whole, the pattern is similar, but with the area around Dorset becoming more important. 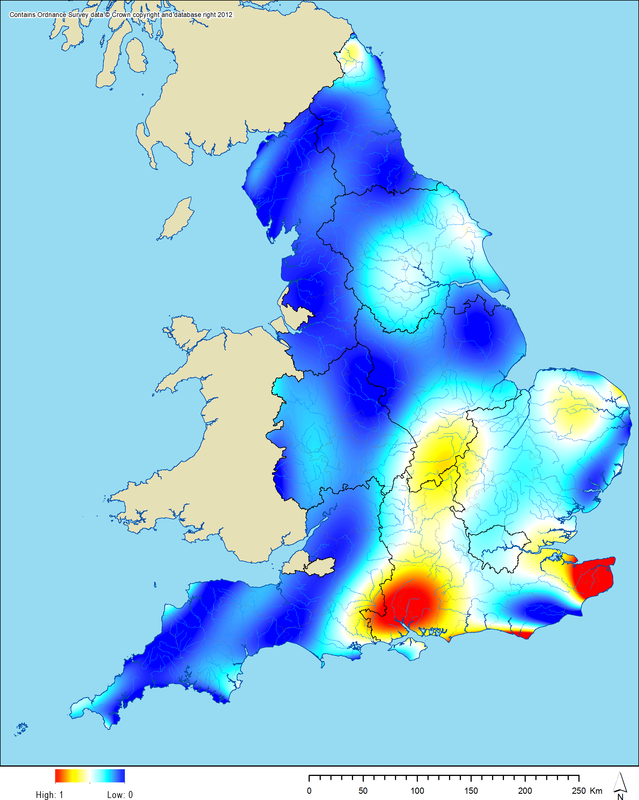 The unspecified prehistoric is biased towards London and Kent, but there are too few of these records to say that this is particularly meaningful. 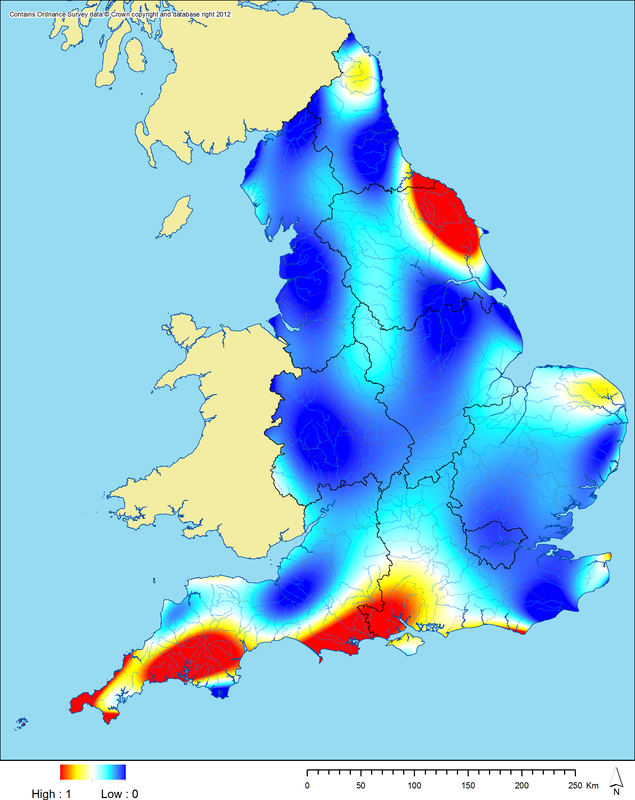 The Bronze Age stands out as very distinct from all other periods, with clear peaks in Wessex, eastern Yorkshire and the Peak District: my assumption is that this represents particular research projects undertaken by EH. 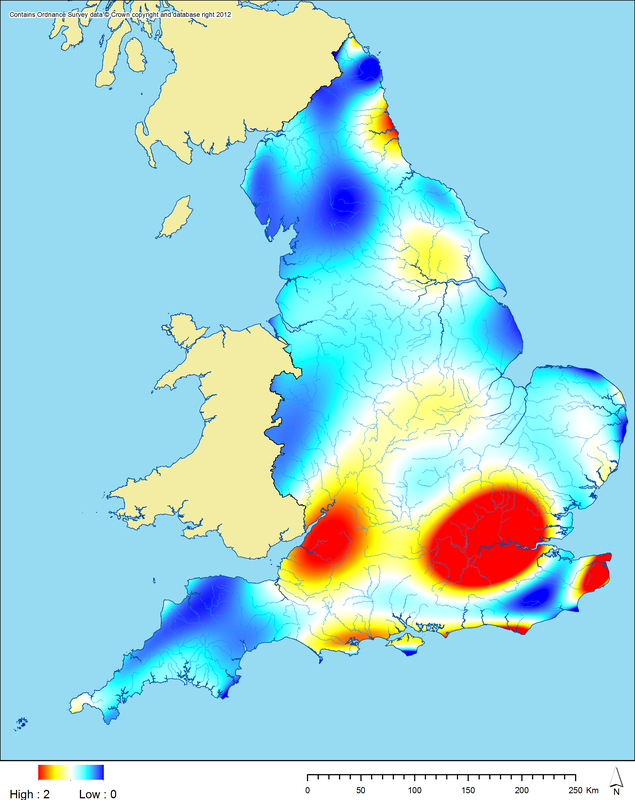 The Iron Age shows peaks north of London and stretching down to Kent and towards Wessex. The Roman trend is similar to the overall pattern for all periods, which is not surprising due to the high numbers of Roman records in the database. 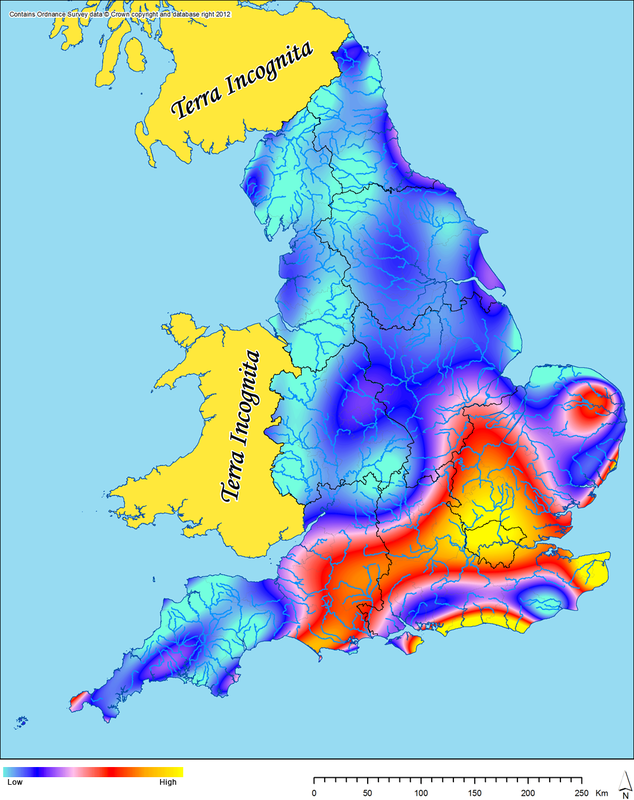 The early medieval peaks around Hampshire, Kent and London, with greater emphasis also on East Anglia than the other periods. Overall, most of these trends are fairly similar to those seen with previous datasets, at least when considered on a broad brush basis. 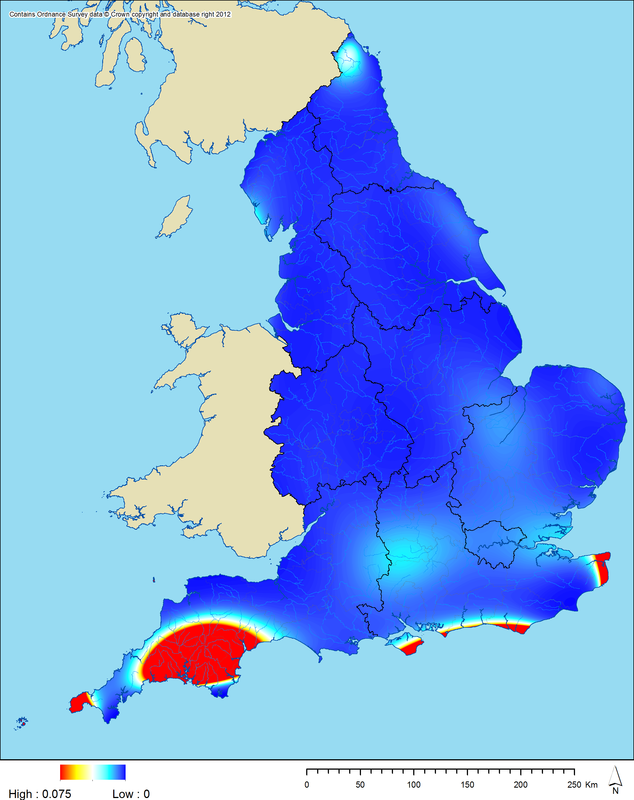 The major exception is for the Bronze Age, where the high trend surface peaks previously seen in south west England are no longer as dramatic. London is also standing out more strongly in the Index than it had in most previous datasets, I think (although this is less pertinent when comparing with the NRHE, as we did not receive NRHE data for London). Further to my previous post, I have now had another go at constructing trend surfaces for the four broad main periods covered by this project. This time, however, I have filtered out records that are explicitly related only to artefact findspots (for each period). This was in an attempt to downplay the influence in the previous trends from differential inclusion of PAS material between HERs. The remaining records should, hopefully, thus primarily relate to sites with other archaeological evidence beyond just one or more artefacts. 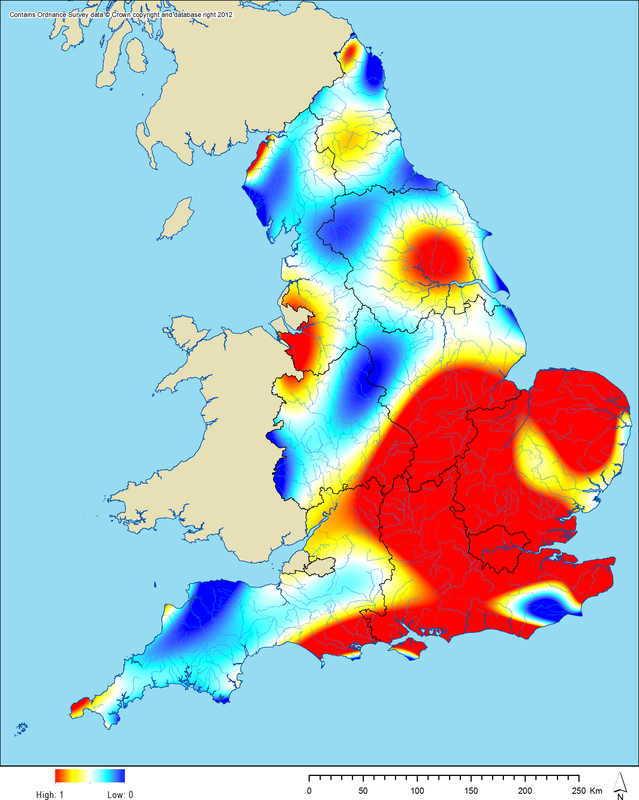 Comparing to the previous surfaces, we can see a general reduction in trend peaks, especially over Norfolk and Yorkshire. 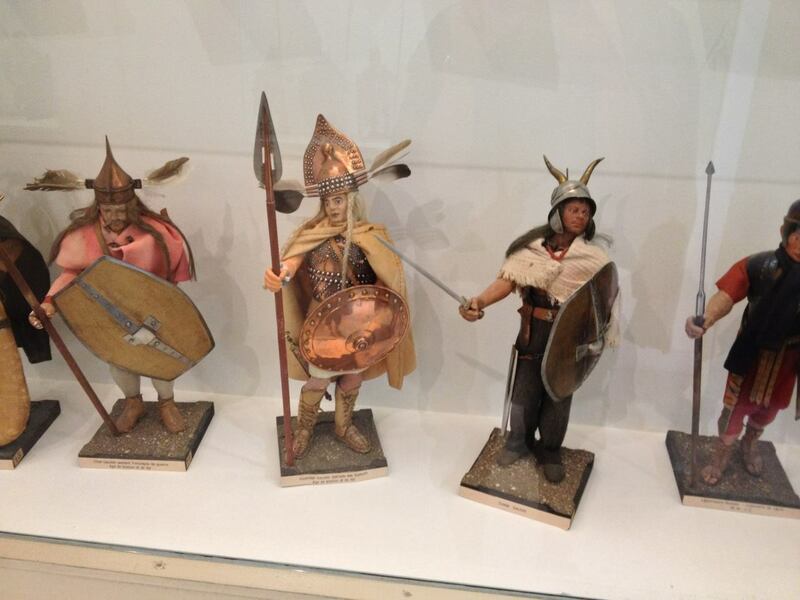 The Bronze Age remains similar to previous; the Iron Age also, albeit with much lower peaks; the Roman period shows an increasing strength across Gloucestershire; the early medieval shows the most distinct reductions in eastern regions. This post follows on from my previous posts on trend surface modelling (I)(II)(III)(IV)(V) and my posts on synthesis of multiple datasets using grid squares (I)(II)(III)(IV). As our HER dataset is now nearly complete (only Merseyside is expected from now on; North Somerset and Bath & North East Somerset are unable to provide data), we are finally able to begin attempting to study the data which we have gathered on a nationwide scale. Broad period classifications (Prehistoric; Bronze Age; Iron Age; Roman; early medieval; uncertain; “bad date” [i.e. outside our period]) were calculated for the HER data using a script (based upon the multitude of period designations applied by individual HERs or upon start / end dates) and the data was converted to shapefile format and merged into a single point layer. This shapefile layer can then be very coarsely queried to produce distributions of records of different periods. I think that there are two major factors at play in this trend. 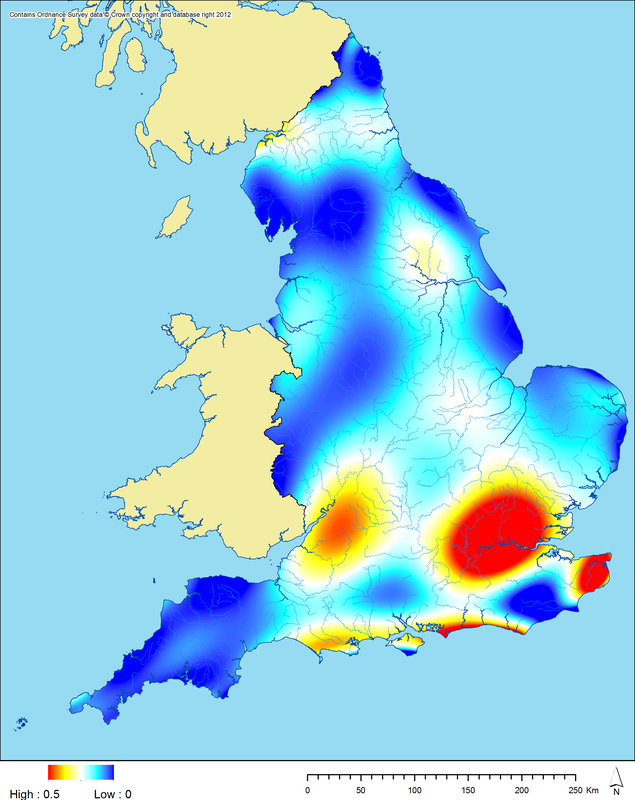 The first is the general bias in English archaeology towards greater density of (probably) settlement and (certainly) fieldwork in the south and east of the country. The second (possibly more dominant?) is the variation in recording methods used across the country. Even where the same software is used, different HERs catalogue their data somewhat differently: some like to split everything up into individual periods and types, others like to collate into multi-period sites; some cast their nets wide to include as much data as possible (e.g. PAS data, MORPH data), others like to only include sites of certain and clear provenance. This means that the density of data across the country is as much about modern practice as it is about activity in the ancient past. These four surfaces still reflect to some extent the differences seen in modern practice, but they are closer to the genuine distribution of past activity. 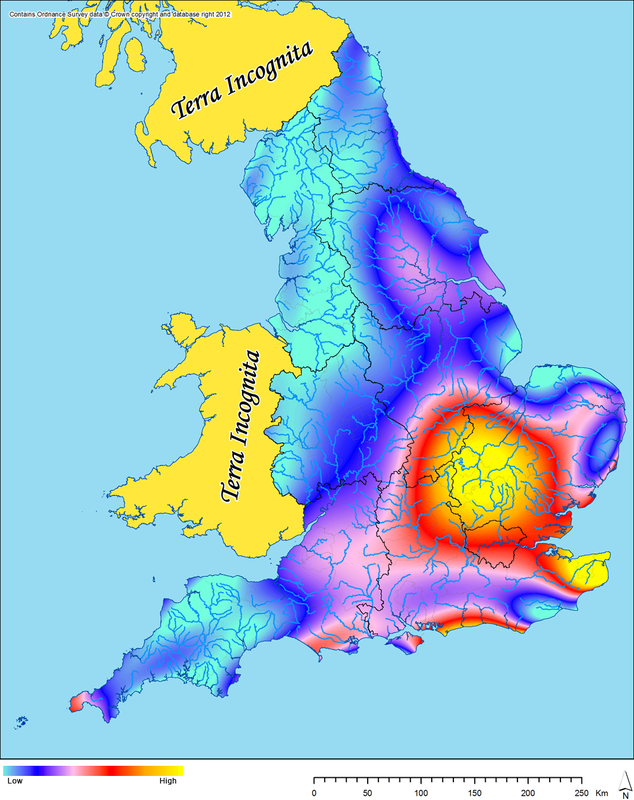 The Bronze Age surface seems to be biased towards uplands and towards Wessex. 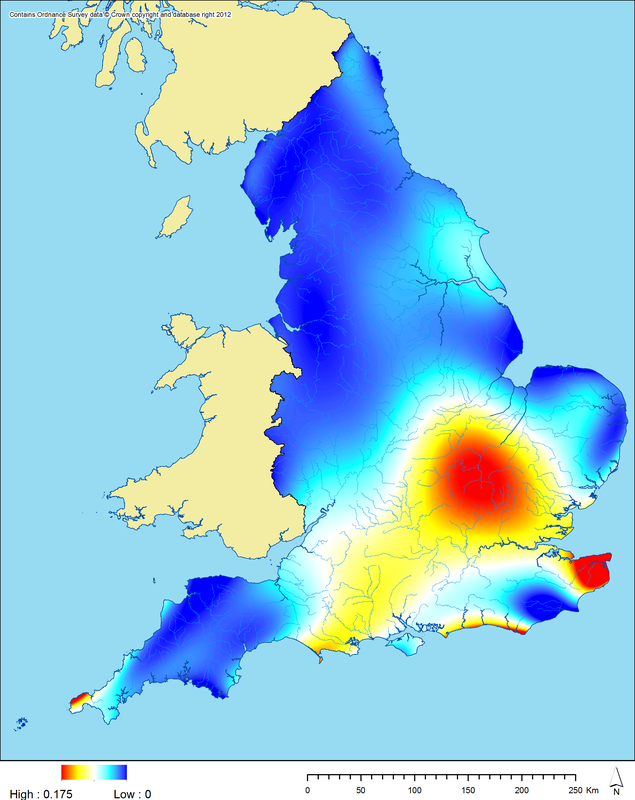 The Iron Age surface has a clear bias towards the south east. 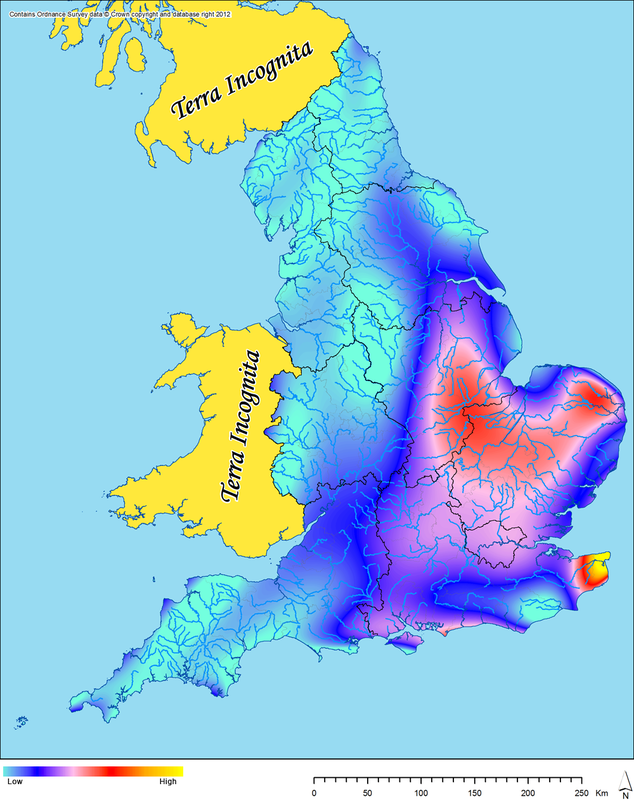 The Roman surface is biased towards lowland Britain but also towards the pockets of military activity in the north of England. 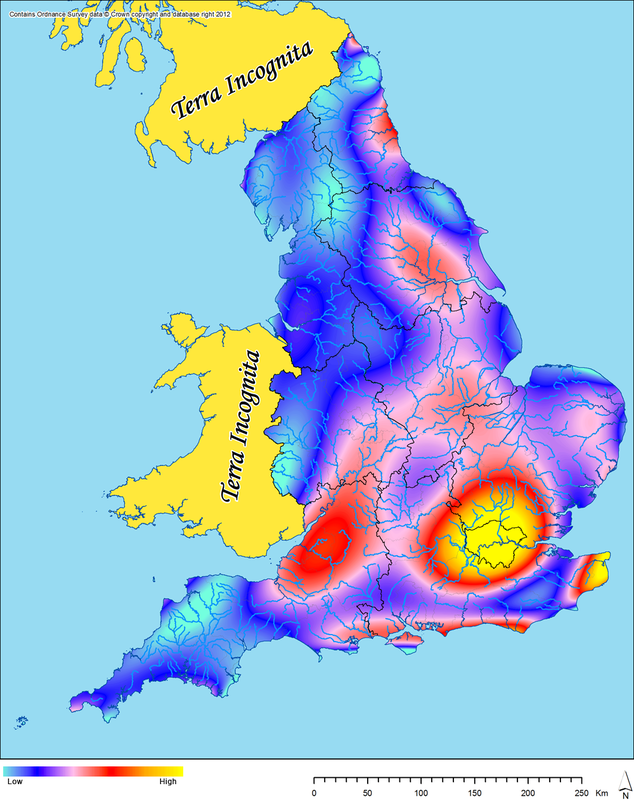 The early medieval surface is biased towards the eastern parts of England. However, the distributions behind all of these trends are still heavily influenced by modern archaeological and CRM practices. This is only going to get worse when we begin to produce duplication in our dataset by building in English Heritage NRHE data and other datasets. As discussed in previous posts, one way in which to minimise these modern effects and reduce the influence of duplication is to collate data by 1 by 1 km grid cells. This requires the application of a thesaurus containing simplified monument terms and the step already undertaken of assigning standardised period terms. The result is a tessellation of 1 x 1 km grid squares across England recording the presence of different types of archaeological site for each of our broad periods, which we can then query and use to produce maps. Trend surface (logistic) for synthesised data: Bronze Age “domestic and civil” category. 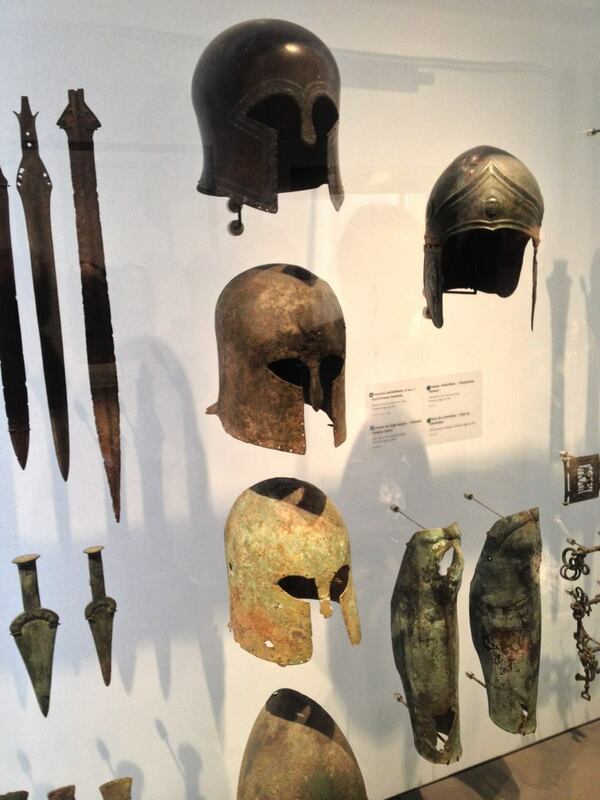 Trend surface (logistic) for synthesised data: Iron Age “domestic and civil” category. Trend surface (logistic) for synthesised data: Roman “domestic and civil” category. 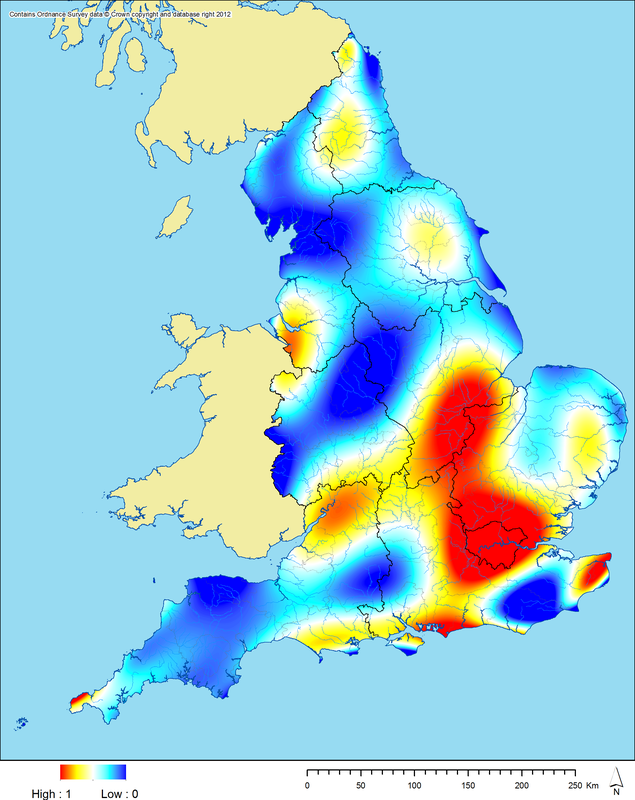 Trend surface (logistic) for synthesised data: early medieval “domestic and civil” category. There is still some bias in these trend surfaces from the amount of data recorded by different modern archaeological entities (e.g. 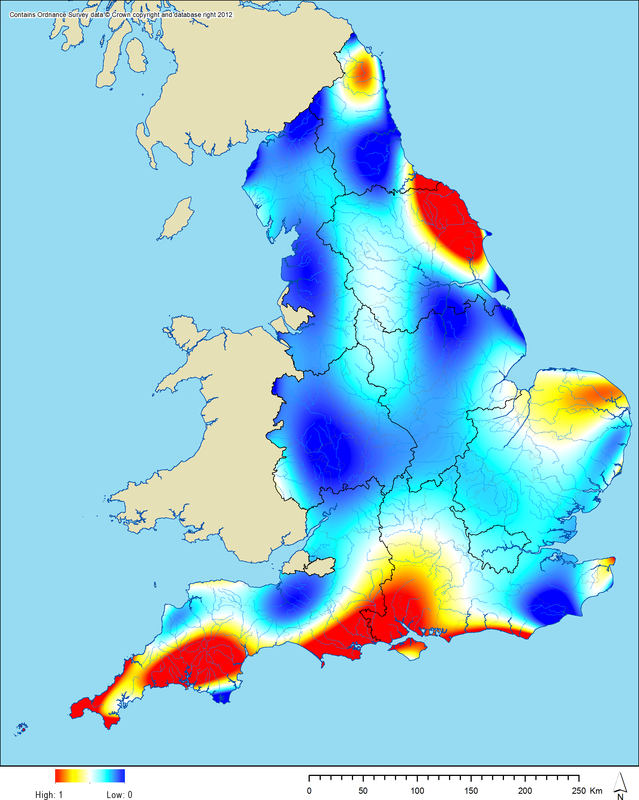 Northamptonshire is a very “completist” HER, which partially accounts for it showing up so strongly in many of the trend surfaces seen in this blog post), but the patterns are still quite interesting. The Bronze Age is heavily influenced by the very high number of records present on Dartmoor and Bodmin Moor. 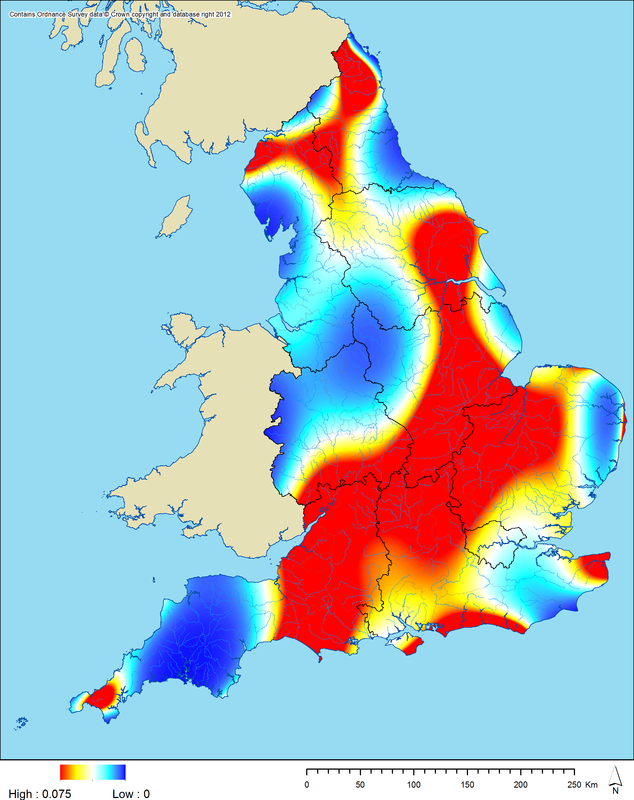 The Iron Age is probably mostly interesting for the low probability area across the “waist” of England from Cheshire to Lincolnshire. The Roman is pretty much how I would expect it: high likelihood in the lowland zone and around Hadrian’s Wall (this includes “native” sites [whatever that means!] of Roman period date). 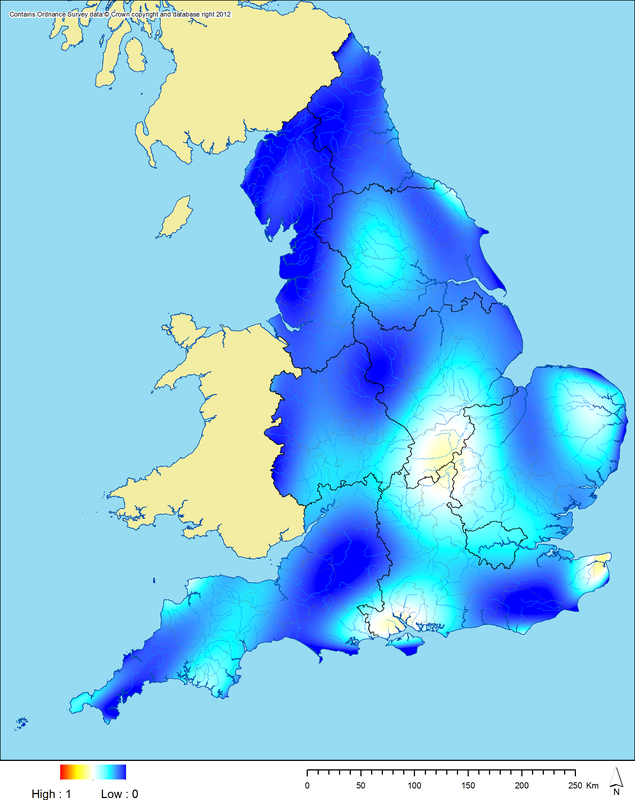 The early medieval is fairly flat, showing settlement across the country with greatest probability in central and eastern England (the peaks in Devon possibly need further investigation). All of this is just a very preliminary, very coarse analysis of what is a very large and detailed set of data. Some interesting patterns are beginning to emerge, but these may diminish as we continue to work on our material. Following again on from my previous two posts (1)(2), I have been experimenting further with constructing trend surfaces, this time for specific sub-sets of my downloaded AIP data for evaluations and post-determination / research results from 1990 to 2010. These results all look quite interesting to me, especially as they all vary quite significantly from the overall trend for all periods (albeit this is less the case for the Roman data). 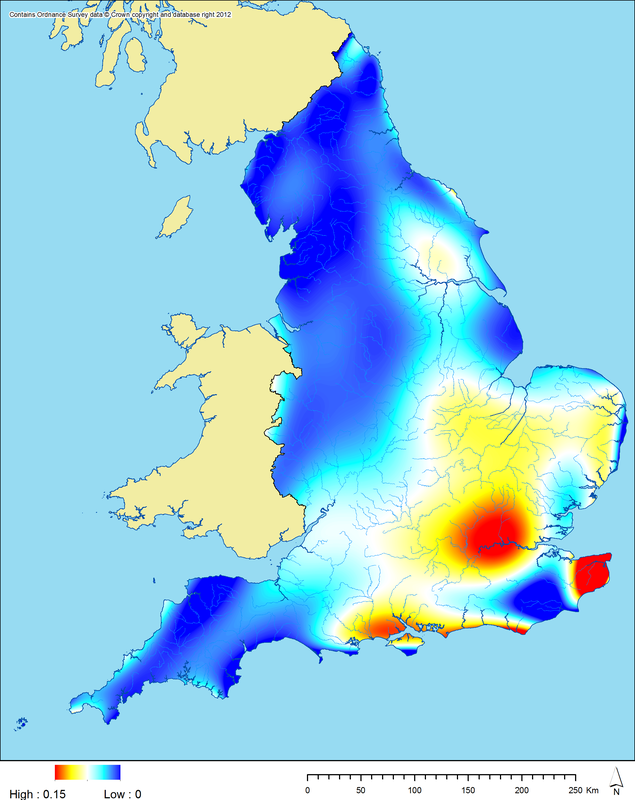 The Bronze Age data shows a very clear bias towards an arc across south-eastern England from Dorset through to Kent and up into parts of East Anglia (the dry bits essentially), with the exception of the South Downs and the Weald. 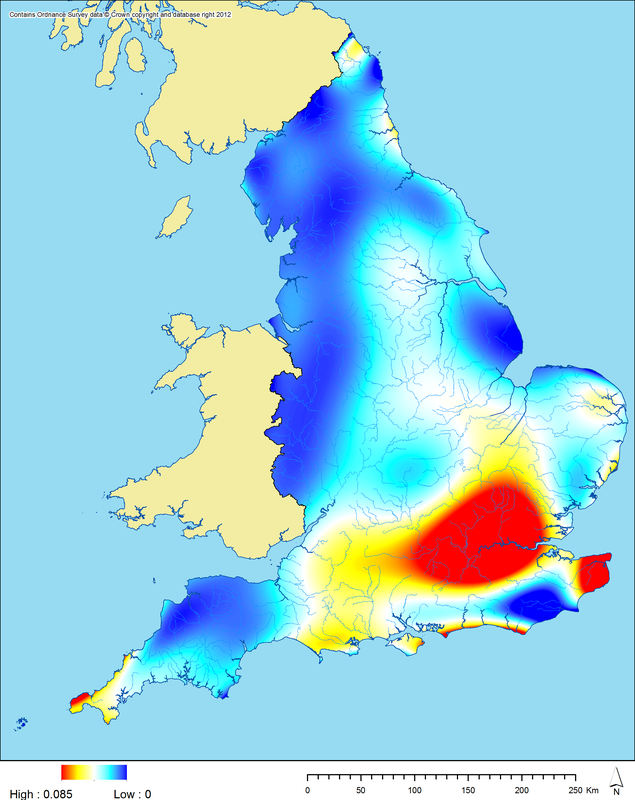 The Iron Age is very strongly biased towards the counties north of London up to Cambridgeshire, across to north-east Kent and along the south coast. 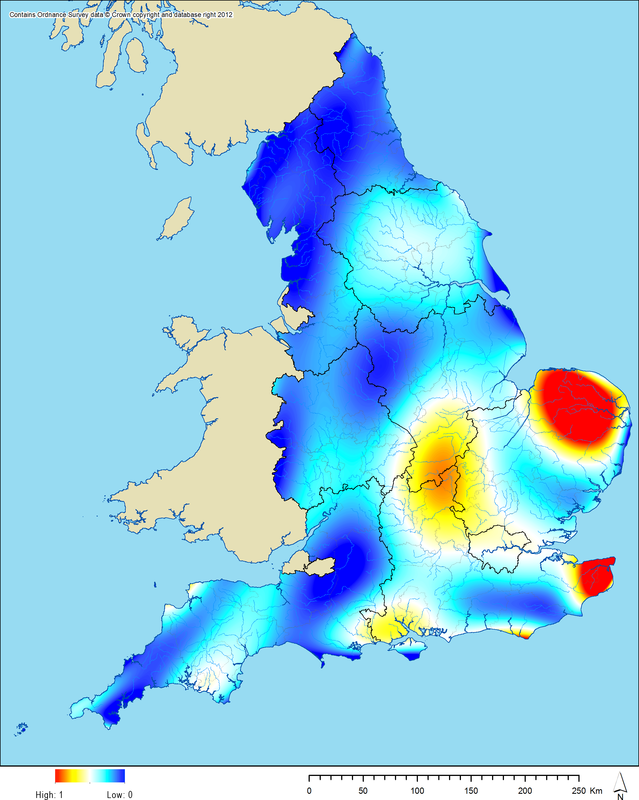 There is also more of a northern trend than in the Bronze Age, with quite a significant peak in East Yorkshire. 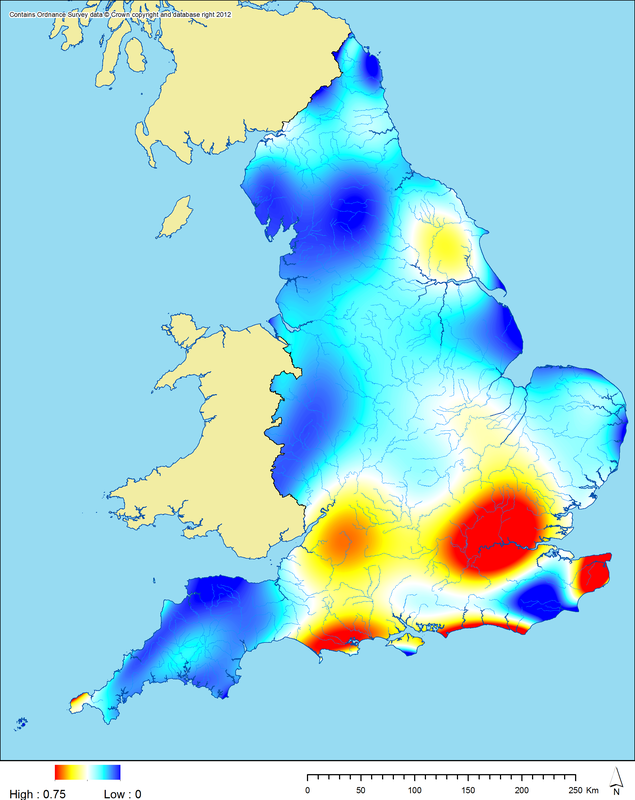 The Roman data is distinctly biased towards London, Kent, the south coast, East Yorkshire and the Severn estuary region. 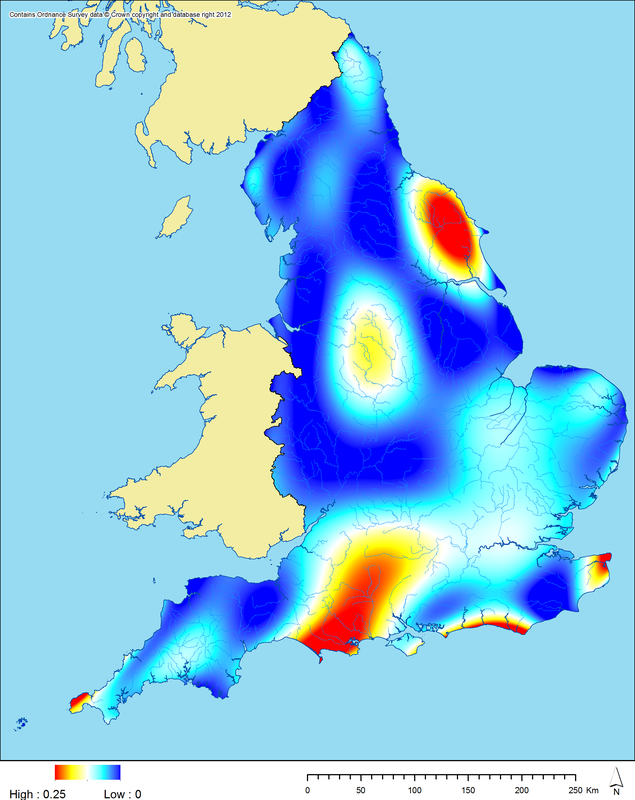 There is a surprising lack of any significant peak in the Tyneside area, considering the significant peak there in the data for all periods and the presence of Hadrian’s Wall. 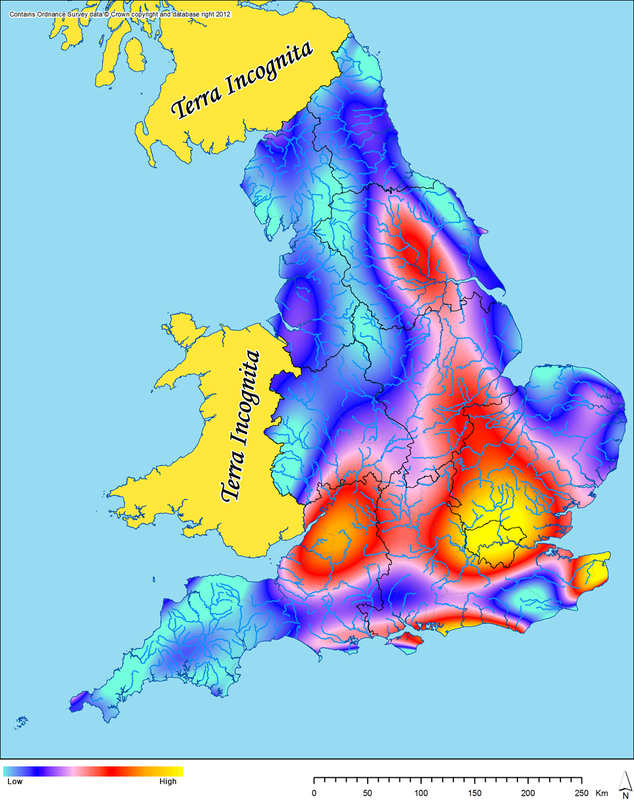 For the early medieval, there is a very clear bias towards eastern England around the Fens and towards Kent. I particularly like these results as they largely differ so significantly from the overall trend for all periods, which suggests that these patterns are more likely to be due to genuine distributions of underlying archaeological data, not just due to patterns of modern fieldwork (albeit this will still remain a very significant factor). I am not sure any of the results are particularly surprising, interpretively, but they do confirm for me that we can extract spatial patterning from AIP data that is not just wholly biased towards areas of significant modern development.